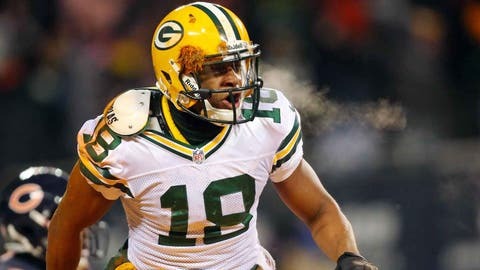 Packers wide receiver Randall Cobb reacts to scoring the winning touchdown against the Chicago Bears. CHICAGO — Minutes after the Green Bay Packers lost in Week 16 at home to the Pittsburgh Steelers, coach Mike McCarthy walked into the locker room and mistakenly told his players that their shot at the postseason was over. Confused by the different scenarios that would allow his team to still make the playoffs, McCarthy soon realized his error and called it embarrassing. What a difference one week made, as McCarthy stood at the podium in the visiting team area of Soldier Field wearing a hat with ‘2013 NFC North champions’ written on it. "I got it right this week," McCarthy said when reminded of his errant message from a week earlier. 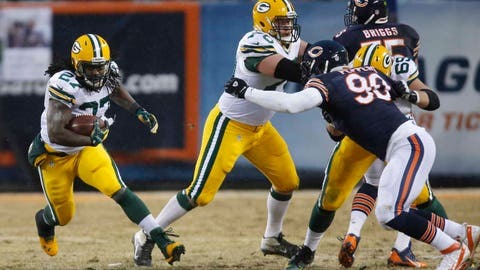 McCarthy referred to the Packers’ 33-28 victory over the Chicago Bears as a "microcosm "of their season. There have been a lot of "peaks and valleys," as McCarthy has called it, that led to a record of 8-7-1. Despite all of it, though, Green Bay will host a playoff game on Sunday, Jan. 5 at 3:30 p.m. against the San Francisco 49ers. "It’s been a rollercoaster season, but I think you have to applaud the organization and Mike and his staff for keeping the guys focused and keeping them together," quarterback Aaron Rodgers said. "I think there could have been multiple times where guys could have fractioned off or said, ‘To heck with this season, its’ not going to happen.’ But guys kept believing in each other." The Packers were 5-2 nearing the midway point of the season when Rodgers fractured his left collarbone. One month later, Green Bay was 5-6-1 and needed a lot of help from the rest of the division in order to have any chance at the playoffs. Rodgers mentioned a few of the improbable things that went right for the Packers in order to be celebrating their division championship in Chicago. There was Green Bay’s tie at home against the Minnesota Vikings after switching quarterbacks from Scott Tolzien to Matt Flynn. Later, was the Flynn-led Packers tying the franchise record for biggest comeback when they overcame a 23-point halftime deficit in Dallas to beat the Cowboys. Though it ended up being inconsequential, the Detroit Lions losing on a 61-yard field goal was big at the time. Even in Green Bay’s victory in Chicago, there was the schoolyard sack-fumble in which Rodgers and wide receiver Jarrett Boykin were the only two players to notice a live ball, scoring a key touchdown on that play. And, finally, Rodgers connecting with a wide-open Randall Cobb on a 4th-and-8 play with less than one minute remaining for the game-winning touchdown. "It will definitely be one of those ones that you’re sitting on the porch one day and this will definitely be one that comes up in that conversation," McCarthy said. With the 49ers traveling to Lambeau Field next weekend, it’s a chance for the Packers to knock off the team that not only eliminated them from last year’s postseason, but that also handed Green Bay a Week 1 loss this season. "We’ve been playing playoff football for the last three or four weeks," McCarthy said. "We’ll be ready to go."